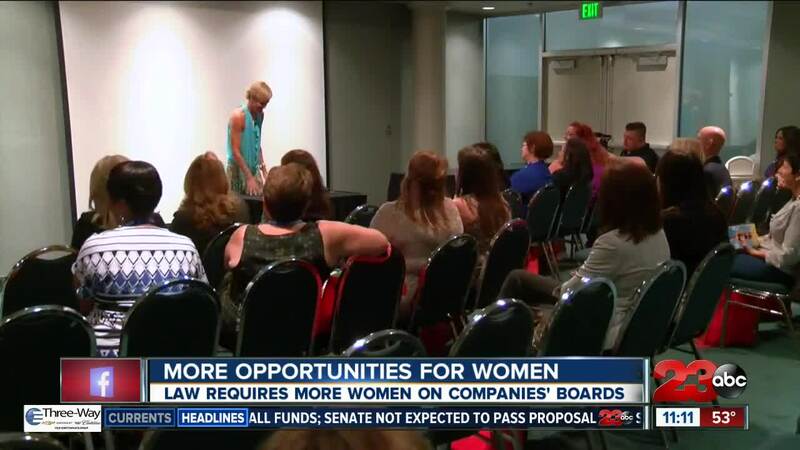 A new law, SB 826, creates more opportunities for women on the board of directors in California companies. BAKERSFIELD, Calif. — "Now that I’m a boss, I love it. But what took me so long?" Senate Bill 826 will make California the first state to require that companies headquartered in California have at least one woman on its board of directors by the end of 2019. "In the past there's been, ‘We just don't have enough experienced women.’ Well, I think we have enough experienced business women." Megan Rios said. Rios Design Studio and Clark is the founder of Mitchell Clark Insurance Solutions . “Women are a growing population in the workforce so more women are establishing businesses and growing and so we need a voice.” Clark said. Rios and Clark said that it's important to have women in these positions because boards are where the most important decisions in a company are made. Arleana Walker, the founder of ShePower Leadership , a local nonprofit with a focus on mentoring young girls in business engagement, says this law is also a good thing for the next generation of business women. "This is really an opportunity to level the playing field for girls. Our oldest girl in the academy is 16, to know that I'm going to have the opportunity to serve on these boards because that's really where change is made,” Walker said. “This is a game changer for not just women but for our world." But not everyone welcomed this new law. The California Chamber of Commerce argued that this new law will result in gender discrimination against qualified men. But business women argue that this law is simply evening the playing field. "This particular bill has not taken anybody off the board. It's only added a position for a woman." Clark said. "Women have been fighting for our rights for a really long time,” Walker said. “It makes no sense and if we don't position ourselves in a position of power, they're ever going to let us in."